An incredibly soft and relaxed unisex hoodie, spun from a plush poly-cotton blend, full zip closure and ribbed cuffs and waistband. 55% cotton 45% poly fleece. 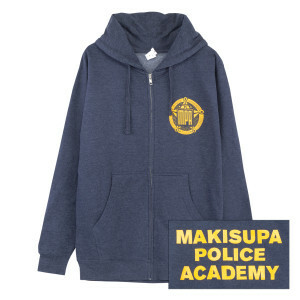 Makisupa Policeman badge printed on front and department on back. Very comfortable, not too warm - I'm in Wisconsin and it gets pretty cold so can't use it as just a jacket. Only real issue for me is that it's a bit tapered in the belly - and I've got one so it's a little snug. Otherwise great overall construction and such.